Welcome to the best local Philadelphia Area Triathlon Event! The French Creek Triathlon includes an Olympic distance triathlon, and a Sprint distance triathlon, along with an Aquabike and Relay division, Athena/Clydesdale, a Collegiate Challenge, and a Team Challenge event. 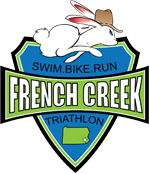 This is the 7th Annual French Creek Triathlon, in conjunction with the ToughKids Philly Triathlon on 5/18/19. Make it a family weekend, by having the kids race on Saturday, stay over at our campsites, or in a cabin, and you’ll have a designated cheering section for your race on Sunday! CASH PRIZES to top 3 Male/Female overall winners in the Olympic distance race. $200/$100/$50 for top 3 M/F. 232 queries in 3.234 seconds.